Last week, I talked about a book without pictures. This week, I am presenting a book without words. 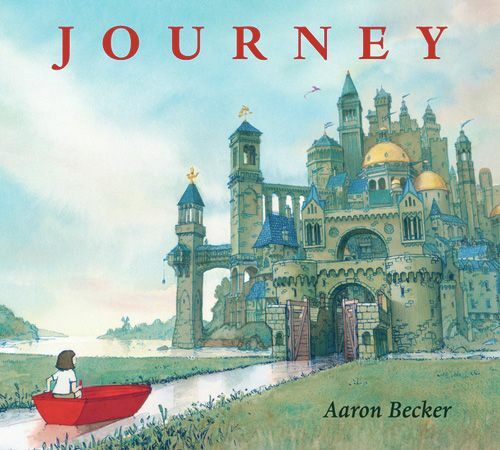 Caldecott Honor winner, Journey, is a beautifully illustrated tribute to the power of the imagination. The protagonist is lonely. Her family is preoccupied with their own pursuits and she has no one to play with. She sits forlornly in her bedroom until she notices a marker on the floor. She uses the marker to draw a door on her bedroom wall. The door takes her into a fanciful world filled with fantastical places and infinite possibilities. The girl goes on a journey using her marker to draw herself into adventure and out of danger and even accomplishes a daring rescue. The illustrations are so natural and fluid that you don’t even notice the lack of words. The contrast between the blues, greens, and browns of the background and the girl’s bright red drawings creates an almost magical sense of wonder. Kids will love imagining themselves into the girl’s world or following her example and visualizing a world of their own creation. Adults, at least whimsical adults like me, will recognize the feeling of imagining a magical world beyond a closed door. They might even wish they had a red marker of their own. As a teacher, I have to add that Journey could be used to teach a variety of reading skills including making connections, inference, making predictions, and sequencing. I recommend Journey to anyone who loves a little adventure.